Hello Lovelies! Before we even talk about this lovely lilac nail polish, let's talk about photography. Whilst taking the photos for this post, my lovely little Canon decided to make my nail polish look pale blue, I honestly don't even understand how it does that so I thought I'd try taking the photos on my new Iphone 6 instead. Honestly, I was so surprised by how good the quality is and I can't even believe these photos came from an Iphone. My blogging journey actually started when I got my Iphone 4s, and that camera wasn't exactly the best so it feels crazy to have a phone now that I'd actually consider using over a proper camera. It's just proof that you don't need the snazzy-est camera ever to blog! Anyway, photography rant over - back to the nail polish. 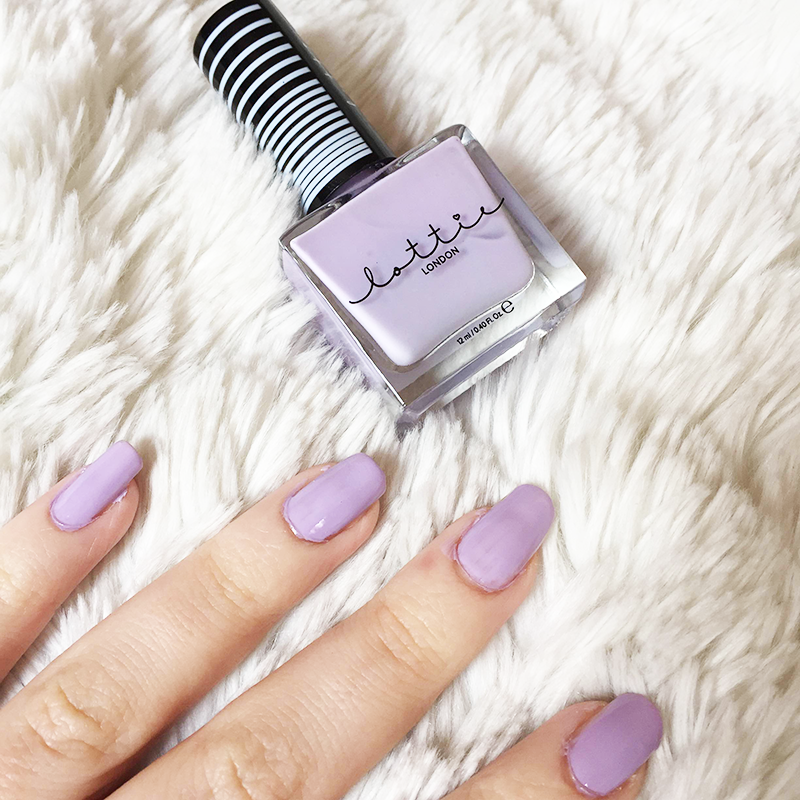 I received this pretty Lottie London Nail Polish in Slumber Party £5.99 for my birthday and let's just say I love the colour - anything in pastel and you've won me over. Lottie London is a brand that has popped up recently and really caught my attention. The collection is filled with pretty brushes, and lots of gorgeous pastels but the one thing that annoys me about the brand is how little information there is about it! I assumed at first that it was a blogger's collection, but it seems that there is no Lottie and it's just branding - which doesn't really surprise me but I was a bit disappointed when I realised Lottie was completely fictional. Application wise this was a little tricky simply because the brush picked up a lot of product at once so I had to be careful when applying it. Also as with a lot of pale colours, this took about three coats until it was properly opaque which I did expect but still it's a bit annoying. However once applied, I've found that this nail polish is actually pretty long lasting with no chips after three days, and that's without a top coat too! So all in all I'm pretty happy with it, my only bug bear is that at £5.99 it's a bit on the expensive side for a high street nail polish considering some of the great nail polishes you can get for a cheaper price. But overall, I'm really excited to try more from the Lottie London collection, and I'm looking forward to seeing if the rest of the collection lives up to this! Thank you for reading lovelies! 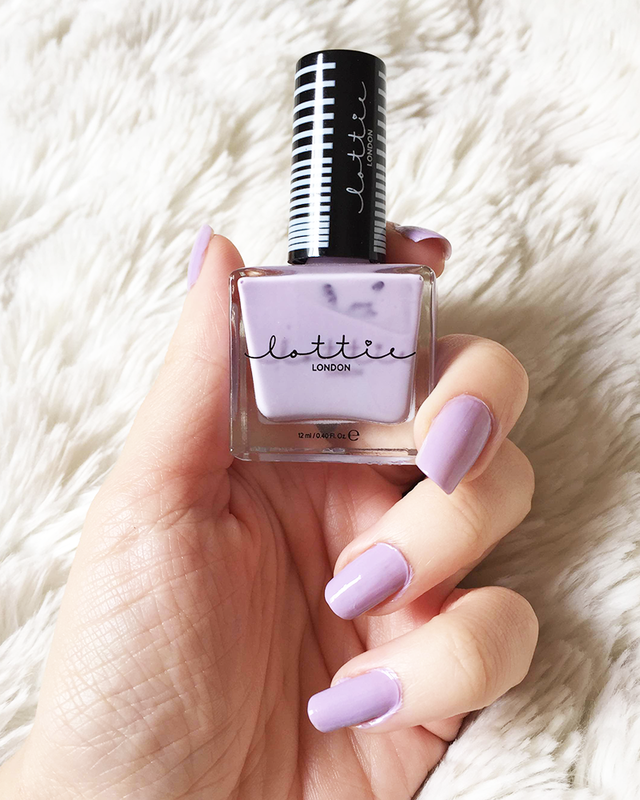 Have you tried anything from the Lottie London Collection? ive never tried the brand, but their price is not too bad compared to essie which is what I LOVE! What a gorgeous colour, I used to take my blog photos on my iphone too or my ipad. I keep seeing Lottie London in Superdrug and I have to say their nail polish shades are SO gorgeous, I love them all, I've picked up two from them already! This is such a beautiful shade! The iPhone 6 is incredible for photos. I originally used the iPhone 5 for photos and then the iPhone 6 and the difference in quality is crazy. I still prefer my camera but sometimes it's nice to just have the simplicity of an iPhone. That is a gorgeous colour and I feel you on the camera problem, that happens a lot to me too. iPhone 6 have a pretty good camera if you know how to use it! And let's take a moment and admire your nails, how do you keep them to be that long? I ended up poking myself when I try to keep mine long. I see this brand in Superdrug sometimes but I've never properly looked but THAT NAIL COLOUR! Wow the photos are amazing to say they were taken by just your iphone! This nail varnish colour is sooooo pretty, perfect for summer. I've never heard of the brand before. I normally just use Barry M, I have three Essie varnishes as well, which are amazing, but I really want to dwell into other brands! !